Developed for risk-based design of complex hybrid systems under a grant from NASA, 2005, SimPRA is an adaptive-scheduling simulation-based DPRA environment developed at the University of Maryland under NASA funding. SimPRA provides an extensive and multi-layered risk model building capability to capture engineering knowledge, design information, and any available information from operating experience, simplifying (and in part automating) the tasks typically undertaken by the risk analysts. In the SimPRA framework, the estimation of end state probabilities is based on the simulation of system behavior under stochastic and epistemic uncertainties. A new scenario exploration strategy is employed to guide the simulation in an efficient and targeted way. The SimPRA environment provides the analysts with a user-friendly interface and a rich DPRA library for the construction of the system simulation model. In SimPRA, a high-level simulation scheduler is constructed to control the simulation process, generally by controlling the occurrence of the random events inside the system model. To stimulate the desired types of scenarios, the input to the simulation model is also controlled, using scheduling algorithms. Rather than using a generic wide-scale exploration, the scheduler is able to pick up the important scenarios, which are essential to the final system risk, thus increasing the simulation efficiency. 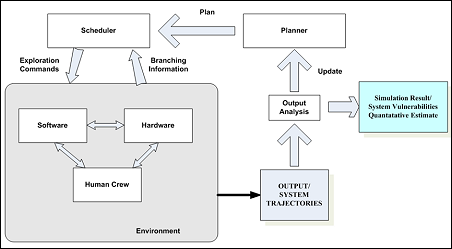 To do that, a high-level simulation planner is constructed to guide the scheduler to simulate the scenarios of interest. Therefore the SimPRA environment has three key elements: planner, scheduler, and simulator. The planner serves as a map for exploration of risk scenario space. The scenarios of interest are highlighted in the planner. The scheduler manages the simulation process, including saving system states, deciding the scenario branch selection, and restarting the simulation. The scheduler guides the simulation toward the plan generated by the planner. The scenarios with high importance would be explored with higher priority, while all other scenarios also have a chance to be simulated. Scheduler would favor the events with higher information and importance values. This is done with an entropy-based algorithm.